A killer is stalking the corridors of Dublin’s Central Maternity Hospital. A young laboratory assistant is found brutally murdered at her bench and the only clue is a blood stained scalpel. The police investigation, led by DS Kate Hamilton, is blocked by a wall of silence from hospital staff, desperate to protect their reputations. DS Hamilton suspects the murderer is among them but as she closes in on the killer, she little realises the hunter has become the hunted. Will Hamilton uncover the killer before he gets to his next victim? Every patient’s nightmare is about to come true. Pause. Breathing clearly heard over the lines. ‘This is John speaking.’ Cautious. Wary. ‘Hi there, Bobby boy, how are you?’ Oily, greasy. Slick Cockney. Pause on this end now. Sharp breath. Clicking of teeth, tut-tutting. Then: ‘Can you get me a girl?’ Firm, pressing. Cut the crap. Grunt. More clicking of teeth. No more tut-tutting. Just business. Terms agreed. He placed the handset down slowly. The frost from his breath misted up the receiver and call box windows. He pulled his overcoat up, tugging slightly on the lapels at the front before walking out into the cold night air. He looked neither left nor right; careful purposeful strides away from the phone booth. As he made his way towards the crowded streets he peeled off the protective gloves he had been wearing. The first he pushed into a used Mc Donalds chip bag he had in one pocket before dropping it into a wastepaper bin. The second he kept for nearly another ten minutes before it too was stuffed into another Mc Donalds bag and dropped into another bin. Like everything he did in life, he was efficient and exact. As bad a baddie as Hannibal Lecter…a fast pace and an energetic storyline. This wonderfully tense read gleefully twists and gnaws at the nerves and has a terrifying sense of ‘it really could happen’ about it. Superb. A brilliant debut..a first rate thriller. 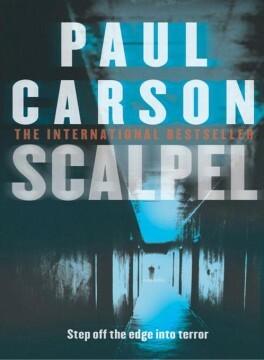 Carson’s pace is helter skelter…a first class thriller.